Here is the Rock Island Line's Corn Belt Rocket entering Grinnell, Iowa, on a snowy day in 1969, on its way to Chicago from Omaha/Council Bluffs and Des Moines. It would only last another year or so before the Rock gave up most of its ghost. Iowa has not had luck getting Obama administration support for passenger rail and we can only hope the president's re-election victory and continued talk about infrastructure turns the tide favorably. Meanwhile, I will remember my many trips on this train, its speed across the farmlands, the dining car it picked up in Illinois, and the wife of 45+ years I met on it. Its a frigid December, 2012, day and here is a Worcester bound MBTA commuter rail train whipping up some snow on its way through Westborough, Massachusetts. One always hopes for a pic like this, and fortunately the train was right on time so my camera and I didn't freeze. This is an interesting time for transportation in Massachusetts. Governor Patrick is proposing new taxes to support new lines, including fixing up rail that would allow trains to run from New York up into the Berkshires, as part of a transportation infrastructure effort. He faces some pretty angry rhetoric from local tea party interests stung by the recent elections in Massachusetts, but the smart money has to be on a pro-rail package in an overwhelmingly Democratic state where many of the proposed improvements are outside the Boston area. Camera Olympus E-300 dslr with Sigma 55-200mm lens. Its Saturday, February 23, 2013, and a snowstorm is heading up the coast of Maine. Luckily for me, it was an hour behind the Downeaster, here arriving in Freeport. And for me, this was an exciting occasion. I have been photographing Downeasters since their inception and hoping against hope the route would expand beyond Portland. Well, one step at a time it has, and the train I photographed shortly after noon would be heading on up to Brunswick having left behind a lot of folks obviously heading up the hill to the vast expanse of LL Bean. As I photographed this scene I thought of Wayne Davis, Pat Quinn and all the Mainers who have made this happen. To add another note, I visited Wells twice for trains in both directions. In addition to the one depicted here every one of them was spot on time. They were clean and crowded and greeted by Wayne's legion of volunteers. Can't beat that. Anywhere. Camera: Olympus E-510 dslr with Oly 70-300 telephoto lens. 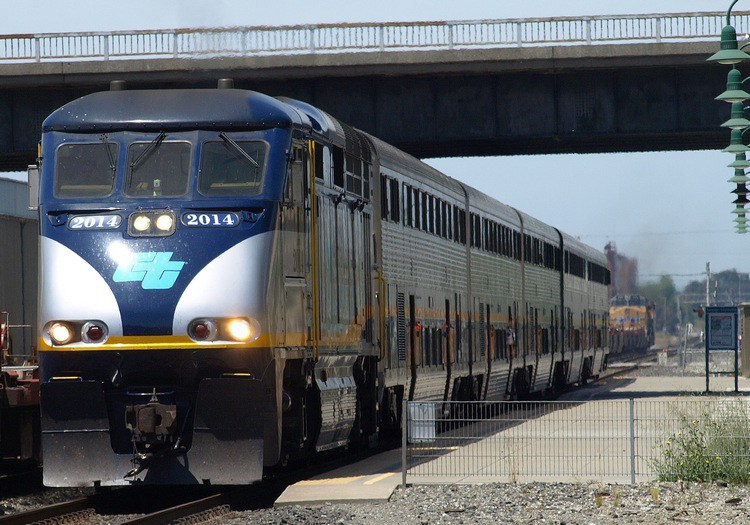 Here's a Capitol Corridor train from Sacramento to San Jose in the Berkeley station on May 19, 2013. The train was on time and gleaming but the new logo puzzles me.....just can't figure out what it stands for. Obviously, Capitol Corridor something, but I welcome any definitive info about what they are thinking The good news is that the service is doing well, even running a train over to Sonoma County for some NASCAR racing. Its also great to see a new service from Auburn to Oakland. Hopefully Colfax, Truckee and Reno will follow. Having put up with Bay Area highways for a week (and trying to figure out how to pay tolls on the Golden Gate Bridge with a rental car) something as simple as a train with good food, free wi-fi and clean windows makes a lot of sense. Now that California's economy is clearly on the mend and draconian service cuts have been avoided we can look forward to some good California train dreamin'. Camera: Olympus E-510 dslr with Oly 14-42 lens. Changes last made on: May 20, 2013.